I did this walk on Tuesday 9th October 2007. 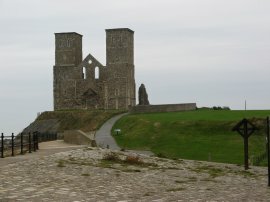 I parked the car in the car park at Reculver which was a bargain at just 70p for the day. I then set off to walk the next four links of the Wantsum Walk, these will take me from Reculver up to Grove Ferry on the River Stour and back again. 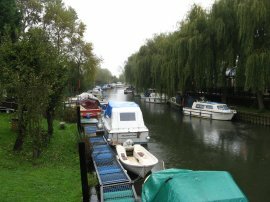 Several miles of the route of this walk is shared with the route of the Saxon Shore Way which I had walked back in July 2006. From the car park by St Mary's Church, photo 1, the route heads inland past a caravan park and over open fields, photo 2, to reach some railway lines. Here the route joins a concrete farm track to pass under the railway lines. This track is followed uphill to Brook Lane, photo3, where the route turns right to head gently back downhill to cross back over the railway lines at Brook Bridge. The Wantsum Walk then turns left along a driveway opposite the barns of Brook Farm. Reaching a house the route bears right and then turns left up a short flight of steps to cross the railway lines for a third time, this time walking across the tracks. Immediately over the railway the route turns right along a concrete track running alongside a large field. The route continues ahead besides a pond where the concrete track turns to the left. 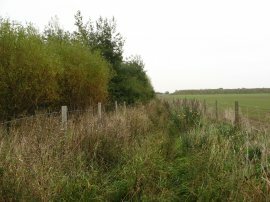 For the first time in the walk the route of the path through the field was a little obscure and I more or less stuck to the rather overgrown field edge as I made my way round to a sewerage works where the route bears left along the fence. Leaving the field over a broken down stile the route crosses a very scrubby piece of ground and skirts round to the left of the high wooden fences surrounding Hawthorn Cottages. Reaching Hawthorn Corner the route turns right along the road and then heads into Maystreet to reach the Heart in Hand Road. Here the route of the Wantsum Walk turns left to take the road bridge over the A299 Thanet Way. Once over the bridge the route follows the course of the slip road down to the A299 before taking a rather overgrown path running alongside the road, photo 4. Reaching a tarmac track the route turns right to start heading up to Highstead Farm. To my right a pair of Buzzards were circling about low overhead, eventually coming to rest in a tree top. A little further along the lane as the route climbed gently uphill I passed a large apple orchard, photo 6. 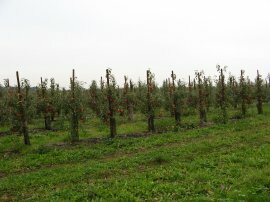 The trees in the orchard where laden with fruit which looked ripe and ready for picking, photo 7. At Highstead Farm the route turns left along a lane that starts heading back downhill to the flat lands of the Chislet Marshes, on the way passing another large apple orchard which I had passed through on the Saxon Shore Way last year. 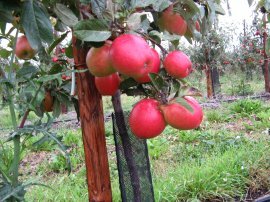 Then the trees seemed newly planted and only a few had one or two apples on them and I was amazed by how much they had developed in the course of a year as they too were covered with fruit. Despite the grey gloomy weather I could just make out the cooling towers of Richborough power station away in the distance as I made my way along the road down towards the Chislet Marshes. Reaching a T junction the Wantsum Walk continues straight ahead taking a low concrete bridge over a drainage ditch and onto a farm track. 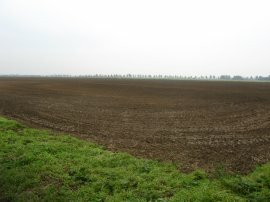 Either side of the track were vast flat fields, finely ploughed ready for their next crop, photo 8. Eventually the track I was following crosses a drainage ditch, the Whitfield Sewer, where the route turns to the right along a low grassy embankment that runs alongside the ditch. 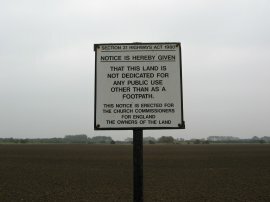 A signpost at the junction about the rights of way stated that the fields were owned by the Church Commssioners, photo 9. 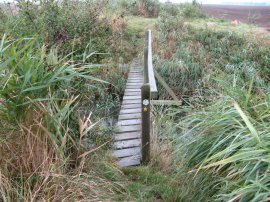 The route heads besides the ditch for about half a mile before taking a rather rickety wooden bridge back over the ditch, photo 10. It had been raining ever since I had crossed over the A299 although not really hard enough for me to need to put my waterproofs on. 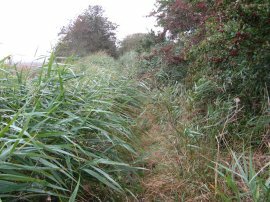 However once over the drainage ditch I had to pass through some quite tall reeds, photo 11, that absolutely soaked me. I didn't realise quite how much water the plants had trapped on their leaves and stems, just waiting for someone to push through and I couldn't have been more wet if I had waded across the drainage ditch. I debated whether to change into my waterproof trousers but hoped that the rain would ease off and that my trousers would at least partially dry out from a combination of body heat and the reasonably strong breeze. 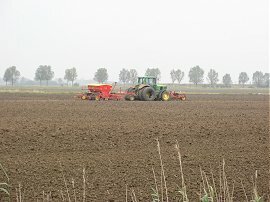 In the fields alongside the path a number of tractors were working away, ploughing the soil and sowing seed, photo 12. 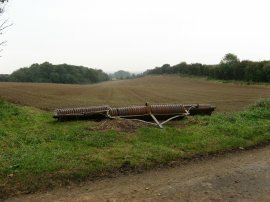 The track soon became broader, photo 13, as it made its way between fields towards the hamlet of Chitty. The track had at one point been surfaced with chalk and the path was incredibly slippery in the sections that weren't covered with grass. Reaching Chitty Lane the route turns to the left and then follows the road round to the right through Chitty to Chislet. Reaching a cross roads the route then turns to the left down Church Lane. 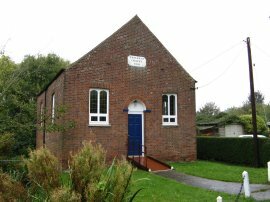 This is followed down past the church, photo 14, and round past a school before taking a footpath off to the left that cuts over the corner of a field to Sandpit Hill. 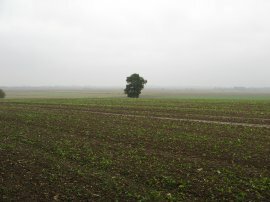 As I was crossing this stretch of newly ploughed field it started raining much more heavily and I gave up wearing my fleece, which although shower proof was now getting quite wet, and dug my waterproof jacket out of my rucksack. The next stretch of road was not that suitable to walk along being rather busy and having no footpath besides it and I kept getting covered in the spray thrown up by the passing vehicles. Heading along the road the route crosses a bridge over Nethergong Penn and heads up Nethergong Hill. Just past Nethergong Farm the route takes a footpath off to the left that heads up steps away from the road to a field where the route passes diagonally under some electricity pylons. Leaving the field the route heads uphill along a fenced path that leads to the A28 Island Road at Upstreet. Here the route turns right and then takes a footpath off to the left that runs from down behind the bus shelter. 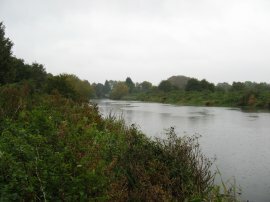 This footpath heads steeply downhill to cross a set of railway lines before turning left along side the Great Stour River, photo 15, to Grove Ferry. Just before I reached the railway lines I stopped for some time under an ivy covered tree where I changed out of my wet Rohan trousers and put on my waterproofs. Leaving Grove Ferry, photo 16, the road crosses back over the railway lines at a level crossing and heads up a flight of steps into a field. 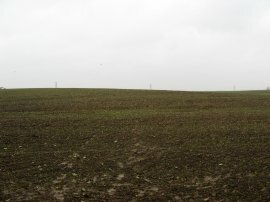 This field, photo 17, had been newly ploughed and because of the rain the mud was wet enough to stick to my boots. 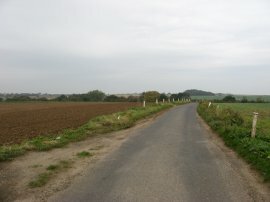 The route then crosses a minor road and heads over another similar field, following the route of the Saxon Shore Way. By chance I stopped and took a photo looking out over the fields, photo 18, from almost exactly the same point I had taken one when walking the Saxon Shore Way. 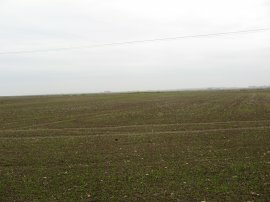 (Click the green text below the photo to see how the view looked in July 2006) . Reaching a hedge the route heads to the right before taking some steps down to another field where the route heads to the right along the Sarre Penn drainage ditch. The route then turns left over a concrete bridge to follow a farm track back to Chitty Lane which completed the first full link of the Wantsum Walk for the day. Turning right I retraced my steps for a short distance along Chitty Lane, past the lane I had got soaked on earlier and this time continuing along the road towards Boyden Gate. 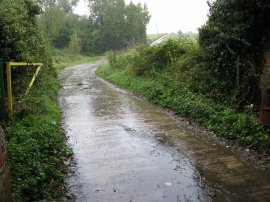 It was continuing to rain incessantly as I made my way along the road and along a footpath that heads off to the right to reach Boyden Gate. 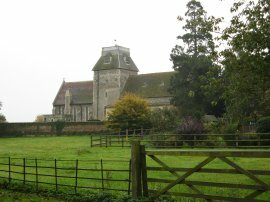 Here the route takes a number of short footpaths between houses, passing the chapel in photo 19, before entering the other side of the large apple orchard I had passed earlier in the day when I was on the road from Highstead Farm. Reaching the road at the far side of the orchard completed the second link of the days walk along the Wantsum Way. I then turned to my left and had to retrace my steps along the road for a short distance to reach a T junction where this time around I turned to my left along the road. Just after passing some cottages on the right I turned left up Reynolds Lane, continuing ahead along a footpath at the end of the road. This leads to a minor road close to a junction with the A299. On the map the Wantsum Walk is shown as crossing the road at this point however this seemed a rather silly choice, particularly given the poor weather conditions and thus I headed off to the right to take a road bridge over the road along the more sensible route followed by the Saxon Shore Way at this point. Once over the road bridge it was just a very short walk back to Brook Lane to complete the third loop of the Wantsum Walk. Due to the bad weather I decided to abandon walking the fourth loop and instead headed back down the concrete track towards Reculver along the route I had walked first thing in the morning. Photo 20 was taken looking up the concrete farm track from under the shelter of the rail bridge. Reaching the car I had walked 14.4 miles, almost all of them in the rain. 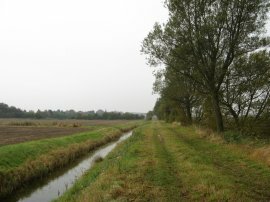 The route today had passed through some very pleasant countryside although it was definitely not looking its best in the rain. On a warm summers day though, this would have been a glorious walk.